The S.T.A.R.S.™ (Student Tracking And Release System) was designed for educators as a tool to simplify the task of tracking and releasing students in an emergency scenario. Utilizing the Accountability Log and a highly visible tag with color-coded receipts and unique numbering, S.T.A.R.S. ensures al..
Student Accountability Tag for S.T.A.R.S. The S.T.A.R.S.™ Student Accountability Tag is an integral part of S.T.A.R.S.™ (Student Tracking And Release System). It was designed for educators as a tool to simplify the task of tracking and releasing students in an emergency scenario. Utilizing the Accountability Log and a highly visible tag wit..
Student Accountability Log Pack for S.T.A.R.S. The S.T.A.R.S.™ Student Accountability Log is an integral part of S.T.A.R.S.™ (Student Tracking And Release System). It was designed for educators as a tool to simplify the task of tracking and releasing students in an emergency scenario. Utilizing the Accountability Log and a highly visible tag wit.. The Campus Command Kit™ was designed as an all risk tool to help schools prepare for ultraviolent incidents. The kit provides schools and private industry with the ability to self-help in the event of a major disaster. Often when disaster strikes an immediate response by emergency services is n.. Emergency preparedness simplified with this 9 position kit. Establishing command quickly is critical for effective emergency response. The DMS Campus Mobile Incident Action Plan Kit empowers Incident Commanders with the toolset necessary to lead effectively. Lightweight, rugged and portable, this co..
Sturdy Full Color Dry Erase EOC Command Board for Universities or Colleges. This DMS-05782 Command Board is an essential companion piece to our DMS-05752 27 Position EOC Vest Command Kit for Universities or Colleges. A must for quick deployment of ICS positions. 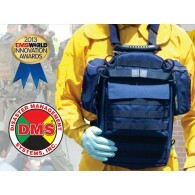 Standard Command Board 36" x 24" ..
DMS-05752 27 Position EOC Vest kit for Universities and Colleges An EOC (Emergency Operations Center) is the physical location where an organization comes together during an emergency to coordinate response and recovery actions and resources. These centers may alternatively be called command ce..
DMS-05779 EOC Tabletop Flag Kit for University/College An EOC (Emergency Operations Center) is the physical location where an organization comes together during an emergency to coordinate response and recovery actions and resources. These centers may alternatively be called command centers, situa..